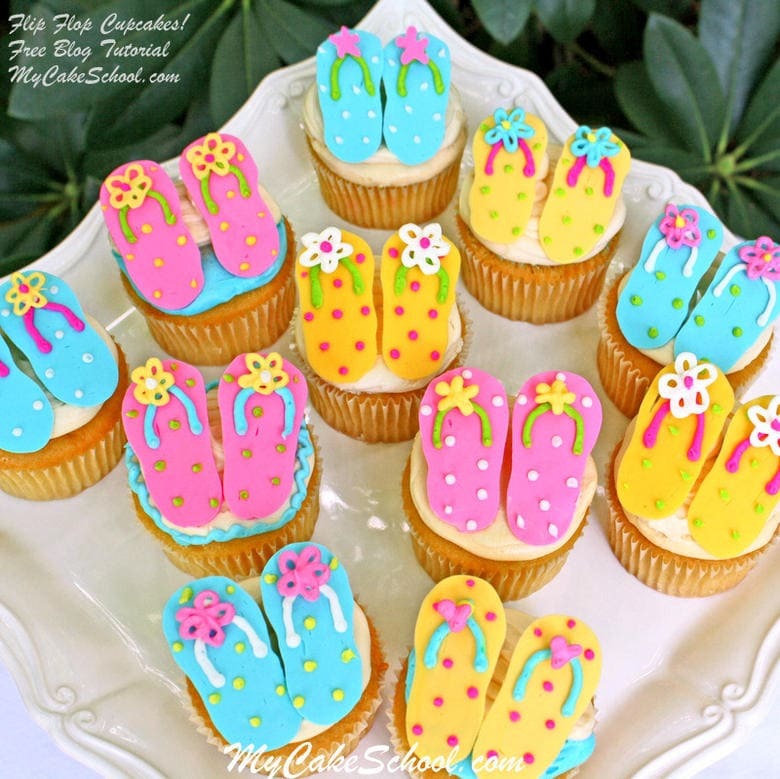 It’s the season for colorful summer themed sweets and these ADORABLE Flip Flop Cupcakes!! These cuties always bring smiles and the best part is that they are so easy to make! 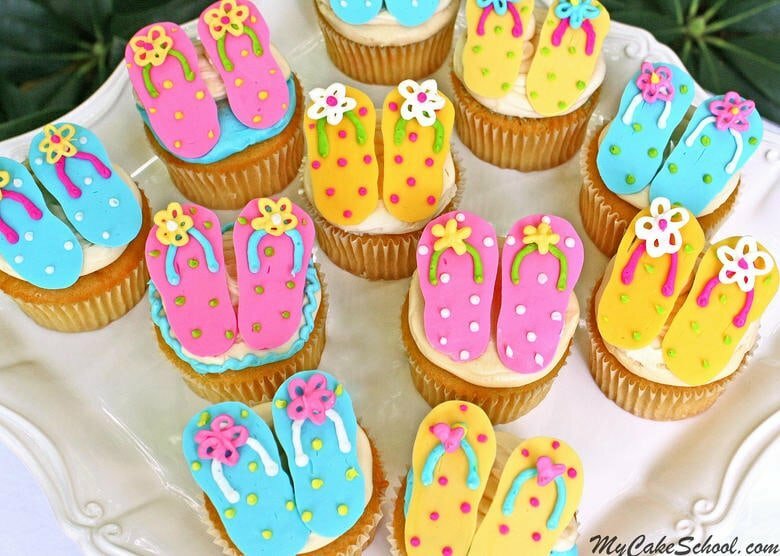 The cheerful color, design, & pattern options are endless, and the theme is perfect for so many events– summertime birthdays for all ages, beach parties, pool parties…or just because they are too cute not to make at least once! We’re using one of my favorite decorating mediums today… candy coating! I LOVE candy coating (aka compound chocolate, chocolate bark, candy melts, etc.) because it is so easy to work with. Candy coating can be easily melted in the microwave, piped, & applied to your cakes and cupcakes in minutes. 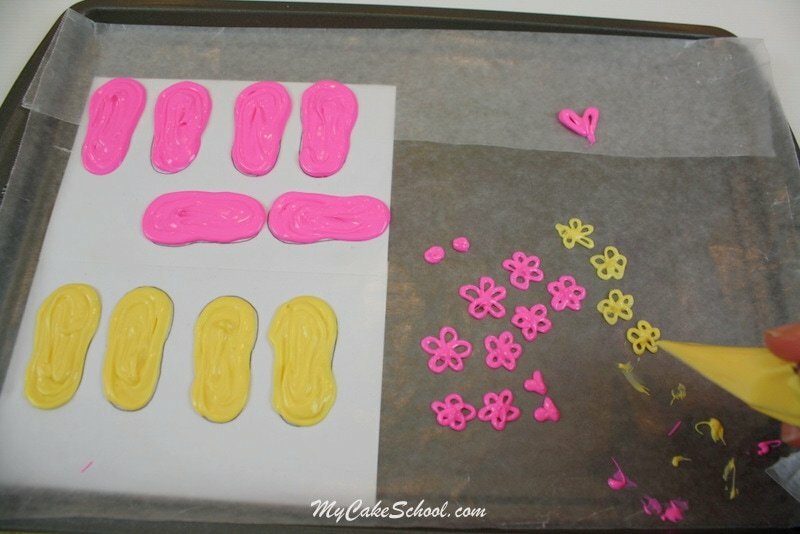 No need to wait hours for decorations to firm up as with gum paste and fondant accents. An added bonus is that they can be made in advance & will add depth to your design too! You can find pre-colored candy coating (Wilton Candy Melts for example), but you can also tint white candy coating to all sorts of bright colors using (oil based) candy coloring. *Do not add regular frosting/fondant coloring gels to your chocolate as it will cause it to seize. Below, you can see my tinted white candy coating– After melting the coating in the microwave, I tinted the pink & blue shades using Wilton Candy Coloring. The yellow was pre-colored Candy Melts (Wilton). As an optional step, I also piped small little flowers, stars, & hearts using a piping bag with a small opening. These will be my accents for the flip flops later. More piping…this time in blue. After piping my chocolate designs, I chilled them in the freezer for about 5 minutes until firm. Time to start decorating! I flipped the chilled flip flops over so that the smooth sides were facing up. Then, I piped on the straps with buttercream (using a small round piping tip (3)) –You could do this step in candy coating also, but I thought that buttercream was a little faster. In the photo, I applied a dot of buttercream to the center of the straps & then placed a chocolate flower on top. This raises the decoration a bit & acts as a nice glue also. The straps & dots are buttercream…everything else is candy coating. 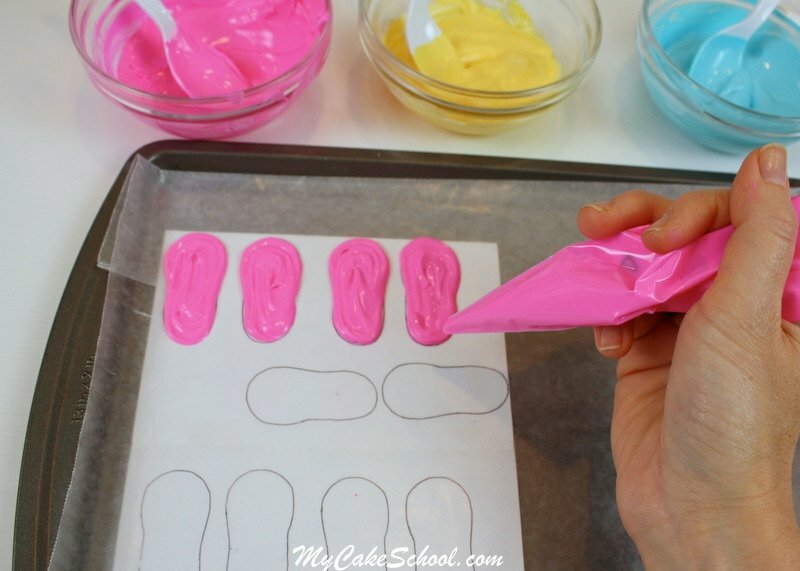 (Buttercream colors: Americolor Deep Pink coloring gel, Electric Pink, Lemon Yellow, & Sky Blue). One of the most important parts of decorating these cupcakes with buttercream is remembering to pipe the two medium sized dots. 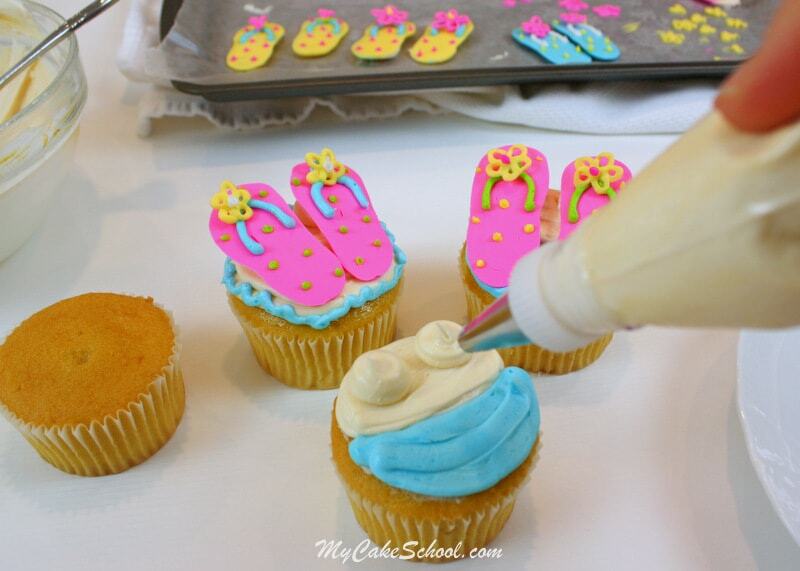 (You can use a Wilton 10 or Wilton tip 12 (or just snip the end off of your disposable piping bag). These dots will prop up our flip flops so that they sit at a nice angle. 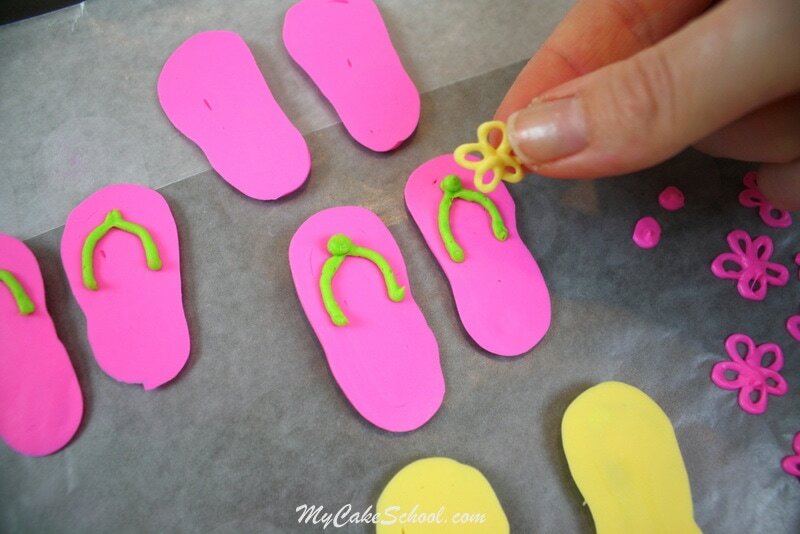 Of course, you could simplify things and lightly press the flip flops into classic swirls also. 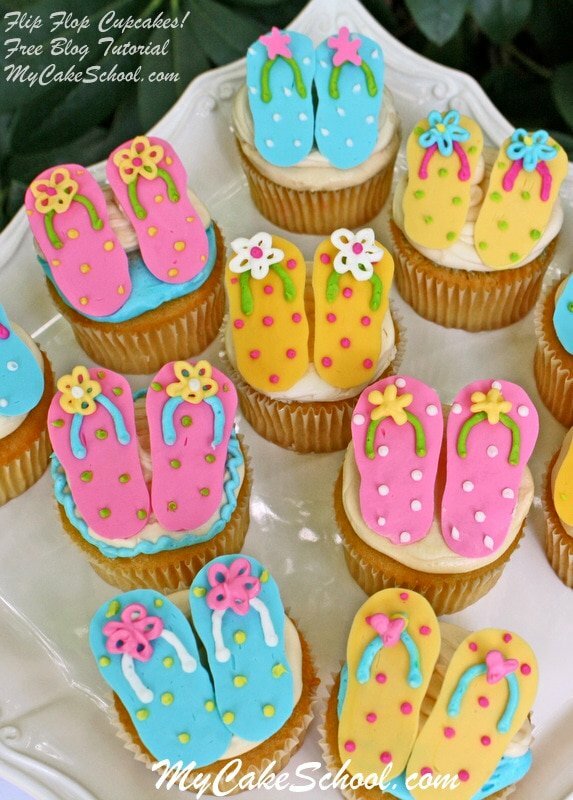 Either way, you’re going to have some CUTE cupcakes. 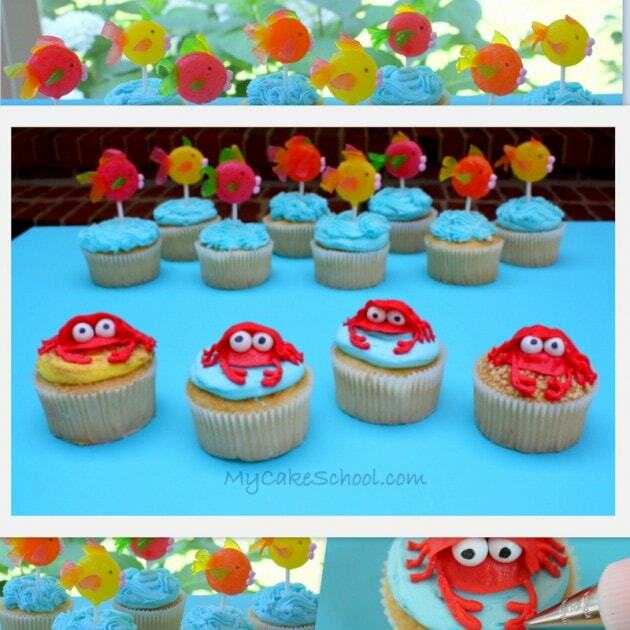 If working in advance, you can store these toppers in a cool room and then chill just before applying them to the cupcake so that they are easier to handle. Finished! I love how these came out, so simple and cute! If you give these a try, we’d love to see! Thanks for stopping by! Don’t forget that we have a huge collection of favorite recipes for cakes, cupcakes, frostings, and fillings in our Recipes Section! I love what you are doing and would love to do it. So where can i go and how much will it cost. I love it! I am just about to make a pool party for my granddaughter and this will be perfect for it. Thank you so much, God Bless you! Super cute! Great idea. Always thinking outside the box. Love that! Sweet! And looks fun to make! Thanks for sharing! Your cute ideas never end! Thank you for sharing! I would like to know if I can use tylosa on my fondant and if is edible or not? Hi Peggy, One common cause is storing the cupcakes in an airtight container, leave an opening in your storage container so that some air can get in. Sometimes the problem is the recipe, a very moist recipe can cause the cupcake liners to pull away. At the end of our recipes (in the recipe section) we note whether or not the recipe is good for cupcakes. When your cupcakes have baked, remove from the baking pan immediately and cool on a wire rack. Also, if your cupcake liners are too large for the well of the cupcake baking pan they can fold over and this can cause pulling away from the cake. Hope some of these suggestions will help.